Eighteen years ago, when the dot-com officer was still wearing nappies and the Ship’s Scholar was barely a bulge in the Admiral’s waistline, the good ship Maamari (predecessor to Mollymawk) was lying at anchor in the island of Antigua. 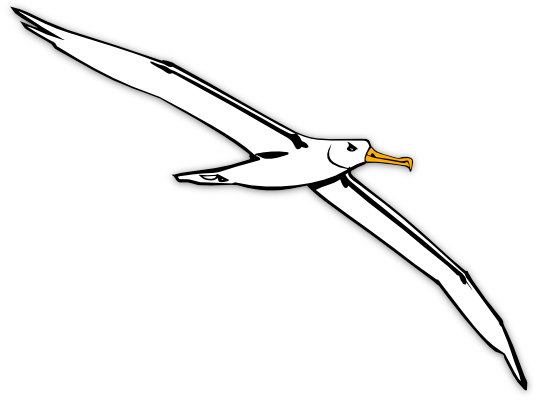 To be precise, Maamari was lying in English Harbour, and in the absolute poll position at the head of the harbour; fifty-odd yards from the dockyard and fifty from the Slipway. 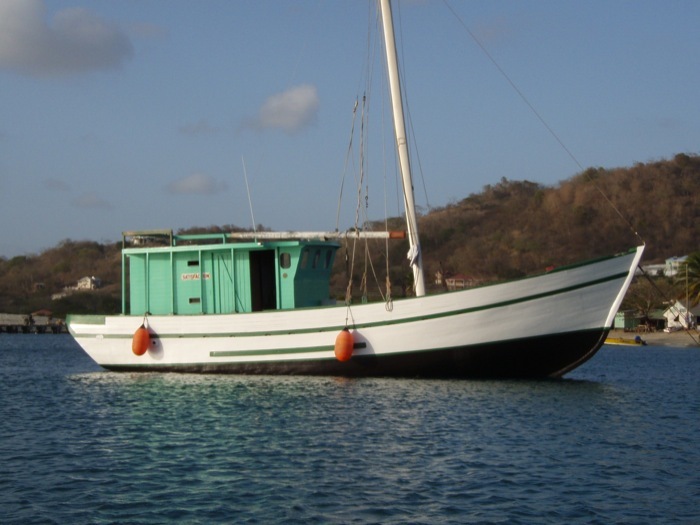 The Antigua Slipway boatyard was where the Captain of our good little ship was earning our daily crust and the price of a new genoa; and Slipway was also the place where he met Carl Mitchell, and Carl’s brother, George, and George’s friend, Eddie. 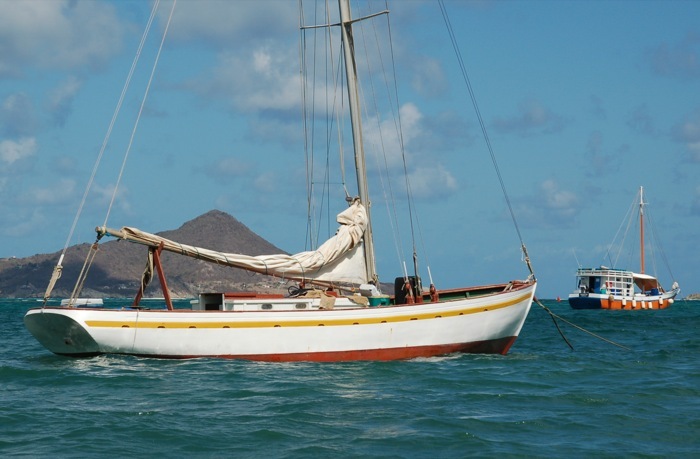 Eddie just happened to be the owner of a rather special boat called Summerwind; and thus it was through his work at Slipway that Nick came to be one of the crew aboard a genuine West Indian deck-sloop. One might expect that the most famous traditional boat building industry in the West Indies would be centred in one of the larger, more populous islands – in Trinidad, for instance; or in Antigua. Instead it is to be found in one of the smallest villages, in one of the smallest islands – and it is to be found on a beach, under a tree. 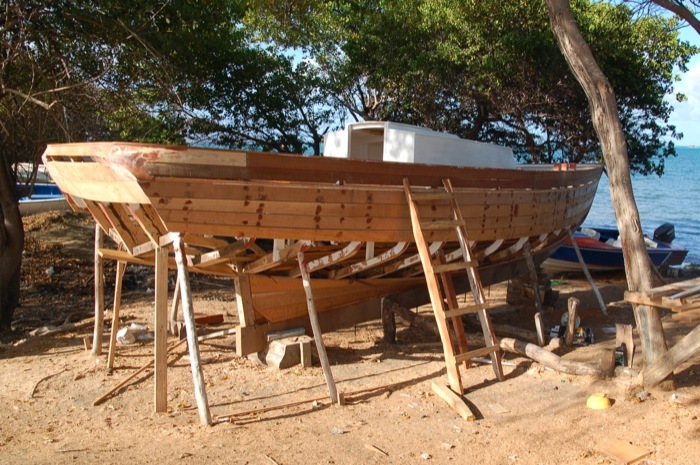 Under the trees in the village of Windward the rum-sodden boat builders of Carriacou carve out frames, and hew planks, and throw together boats using the tools and the methods employed by their ancestors – plus a few new tricks that they have picked up from the yachting industry. 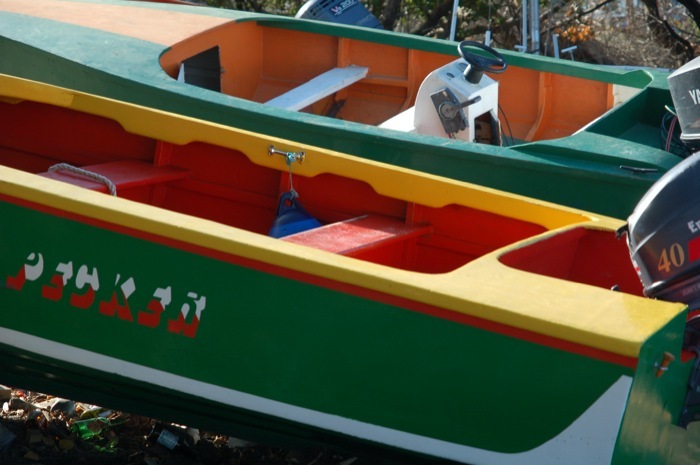 Rumour has it that the forefathers of the present-day builders learnt the art of producing fast boats, rather than long-lived ones, because that was what was wanted: a design, and a boat, which could out-run the customs and excise cutter. 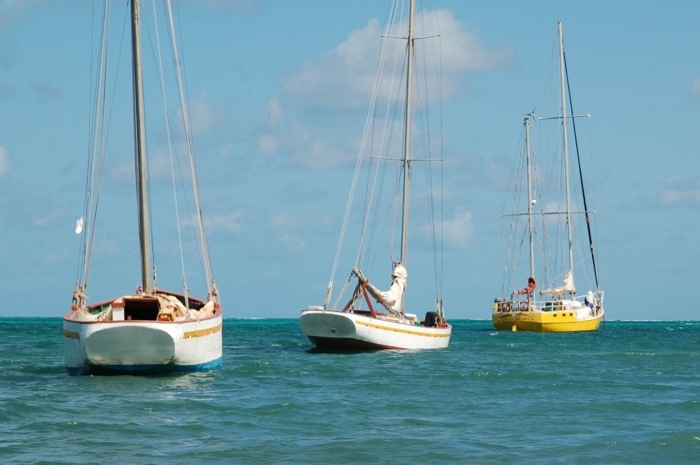 And the fruit of this tradition is a classic boat which outsails the competition and wins every regatta throughout the Windward Islands. 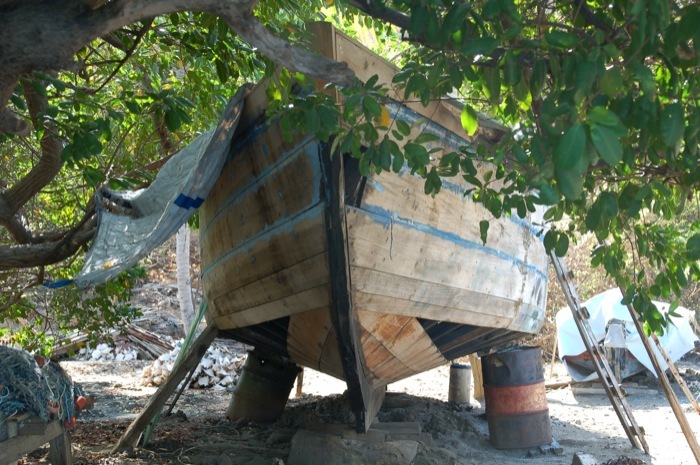 Naturally enough, having sailed aboard Summerwind, our skipper was very eager to meet its builder and to take a look at the new vessels under construction in this rustic shipyard in Carriacou – and so too, was the ship’s photographer – but before we could visit the place we had to get there. 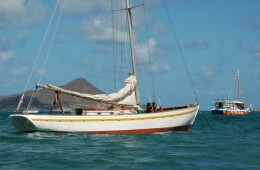 Windward is not a sheltered anchorage nestling in the lee of the isle. 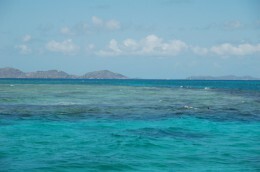 Indeed, it’s name makes it’s situation clear; it lies on the wave-swept eastern shore of Carriacou. Naturally, it lies behind a reef – otherwise it could not exist at all, as a harbour – and in order to reach safe haven one has to follow a devious route around the coral heads. The buoys purporting to mark the channel often drift from their allotted stations, and the post which is supposed to mark the end of the inner reef has now fallen over… In short, entrance to Windward is not a thing which should be attempted in poor lighting conditions, when the sun is low or keeps ducking in and out behind the clouds, because in poor light the coral is invisible. 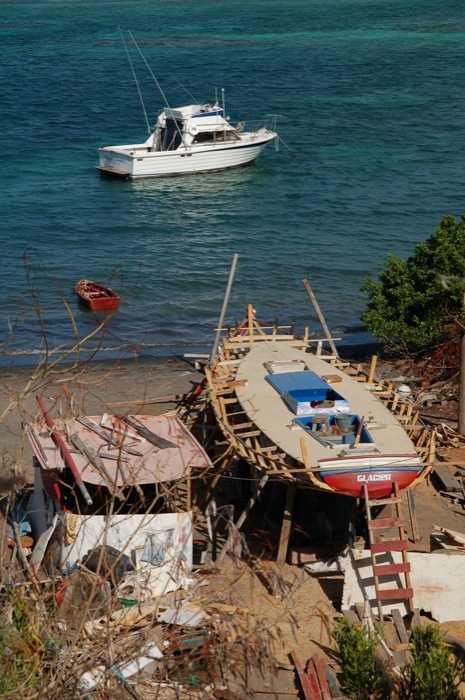 No sooner had we set foot on the sand than we were welcomed into the village; and no sooner had our interest been made known than we had a self-appointed guide who offered to take us to visit every boat and every builder (and every bar) in Windward. “Wha yuh a-do, Mem?” his friends called out to him as we passed. 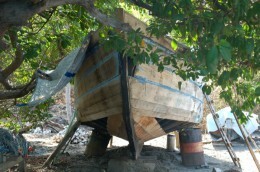 Carriacou boats are designed in the old-fashioned manner: by eye, and without recourse to a tape measure. Their keels are made from greenheart which is imported from Guyana. 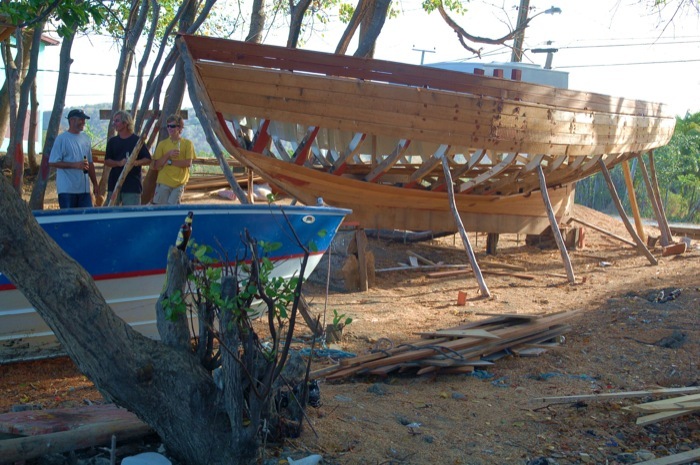 After the keel has been laid, and the boat has therefore become something more than a rum-shop boast or a smoker’s-dream, the village celebrates the event. In past times the keel was bathed with the sacrificial blood of a goat and blessed by the utterance of secret words, but nowadays, we were told, they don’t usually mess about with the goat; they just roast it and eat it, washing it down with large quantities of Jack Iron. The boats are framed with a local wood known as white cedar. According to Paul Johnson (himself a boat designer and builder, of course) this timber is good only when it is cut at exactly the right time of year. 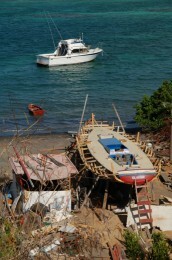 The Kayak (Carriacou) boat builders choose their own trees, fell them themselves, and arrange their haulage down to the shore. 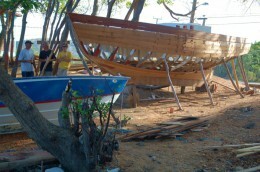 Then they set about cutting the timbers which will form the skeleton of the boat. 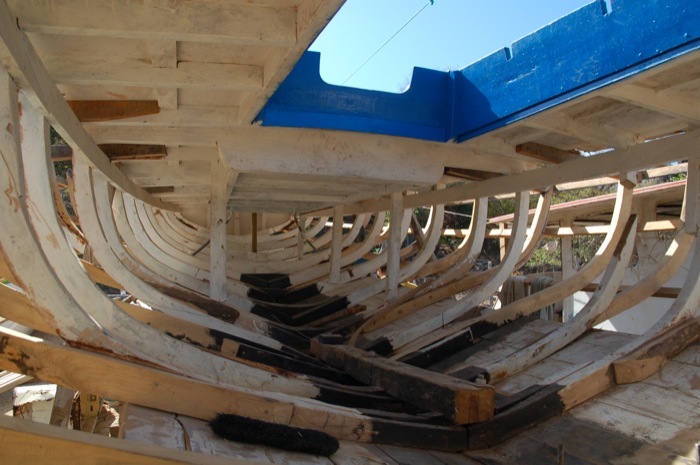 Most of the frames are grown (which is to say that they are cut from one piece of wood which was especially chosen for its appropriate shape) but we noticed that in each boat a few of the frames were made from timbers which had been scarfed together. The scarfs (or joins) were short (ie they had a only a short overlap) and they were doubled (or reinforced) with pieces of plywood nailed and glued onto one side. 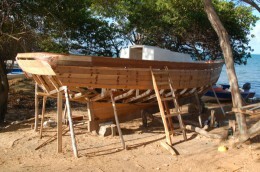 The deck-sloops are planked with cheap Guyanese mahogany which is fastened onto the frames using silicone bronze nails. 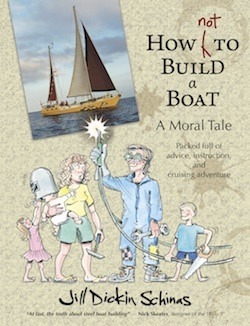 Not a technique which would be approved by Lloyds, or by anyone who has trained as a Shipwright – quality boat building requires the use of screws – but the method is far from unique. Indeed, we have come across plenty of boats, both on our travels and in the motherland, which were built using nothing better than galvanised nails. More unusual is the manner in which the planks are laid up. 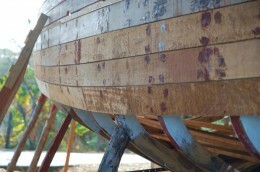 As a rule, boats are planked from the keel upwards, the pieces of wood being carefully tapered on one side so that they adopt the required shape. 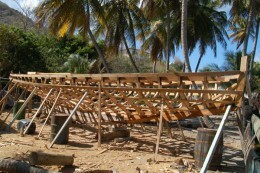 Here in Carriacou work begins at the deck, instead of the keel, and the planks are all of uniform width. When the planking reaches the turn of the bilge the men start work from the other end – at the keel. Where the upper and the lower planking meets they must then be bodged together; or at any rate, that was how the matter appeared to my untrained eyes. A good paint job will soon hide this “bodgery”, just as it will also hide the rubbishy plywood – paint is the make-up which can turn a shapely but crudely fashioned boat into a beautiful lady – but will the planking last, and will the decks remain sound? As we made our way along the strand, paddling through the surf and clambering around the mangrove roots to get from one little “boatyard” to the next, Mem told us about the different types of local boat. The small “double-enders” take part only in the local Grenadine regattas. They look heavy but are actually very lightly built with extremely thin plywood decks. Some are so beautifully fair that I at first mistook them for fibreglass boats, built in a mould. 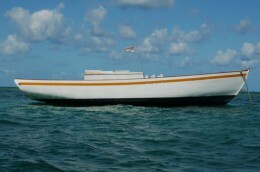 The double-enders are 16ft long and are fitted with a very unusual, very high-aspect sprits’l rig. Equally light and fair are the astonishingly wide and flat, “open sloops”. Like the double-enders these high-powered machines are ballasted only by a centreboard and by their acrobatic crew. 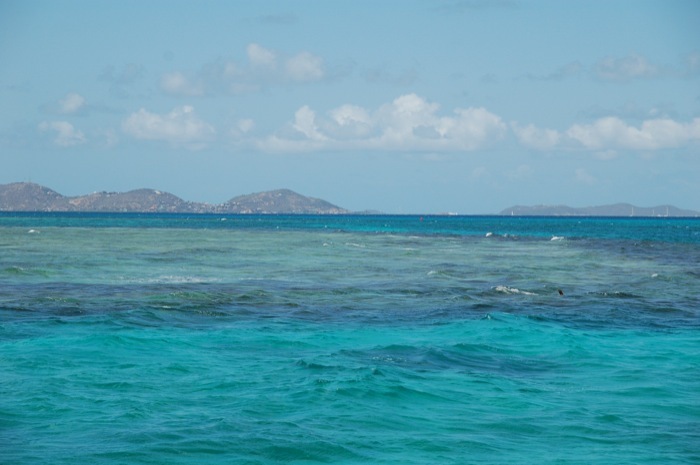 They seemed to us to be unique to Carriacou and the Grenadines, and we were struck by the fact that they are completely different from the traditional racing boats in the more northerly islands. In Anguila, for example, the boats are smaller and less radical. 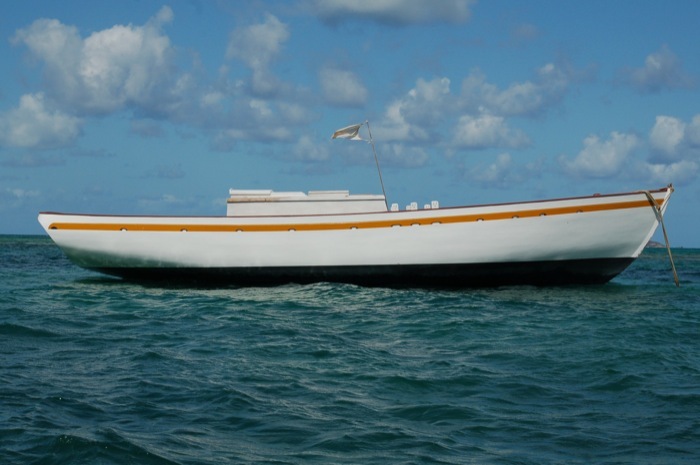 Seemingly, just as each town around the coast of the British Isles evolved its own type of fishing boat, so too, in the days when there was little communication between the Caribbean islands, each one developed its own little racing dinghy. 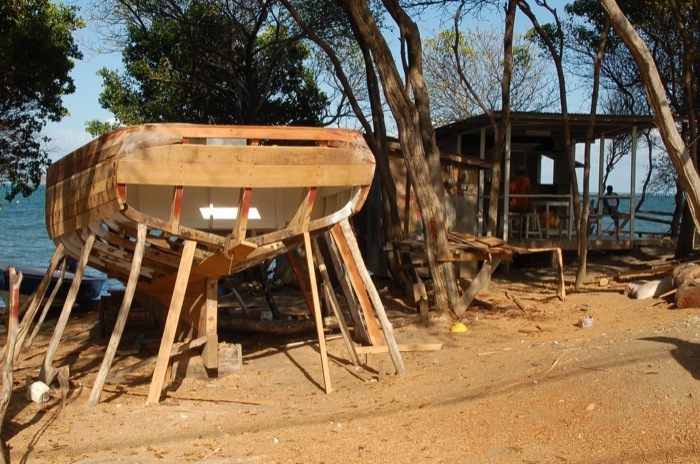 Besides making racing boats the Kayak shipwrights also build small plywood runabouts, which skim over the waves, and big high-sided motor vessels which carry cargo between the islands. The runabouts are a new thing, inspired by the sighting of an imported speedboat, but the cargo vessels are as old as the village. In fact, it was the need for cargo boats which caused a Scottish land-owner, in the 19th century, to call in a team of Scottish boat builders; and it is from these boat builders that the current practitioners claim descent. 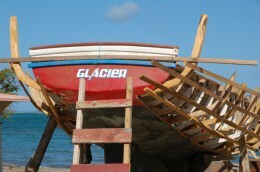 Like the smaller vessels, the cargo boats are built on the beach. When ready for the sea they are carefully lowered down onto their starboard bilge and dragged over the sand on logs. The launch of one of these little ships is a big event – but it is nothing to rival the excitement surrounding the launch of a “deck-sloop”. It is of these highly competitive classics that the builders are most proud, and it was these boats which our “tour guide” was most eager to show off. The first boat which Mem took us to see was no more than a shapely framework and, as such, she had no name. 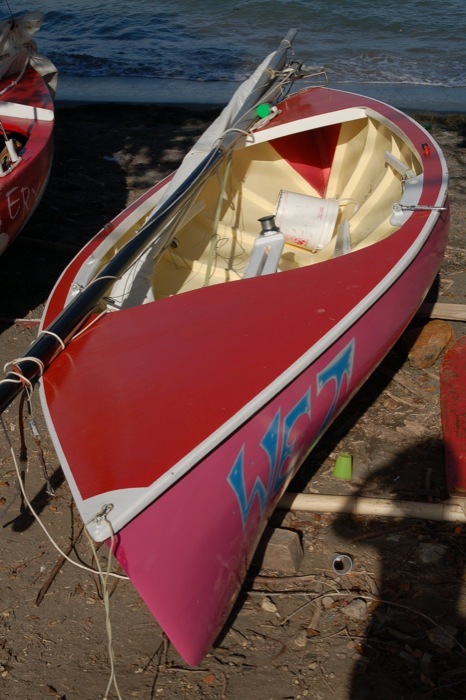 Around here, boats are not named until they hit the water and receive a baptism of Jack Iron. Further along the beach stood Glacier. She was first launched a year or two ago and was very successful, but she is now being made longer and much wider. Her frames have been cut, half-way up, and new pieces have been scarfed in to take up the new shape. Her deck beams are also being extended in like manner. 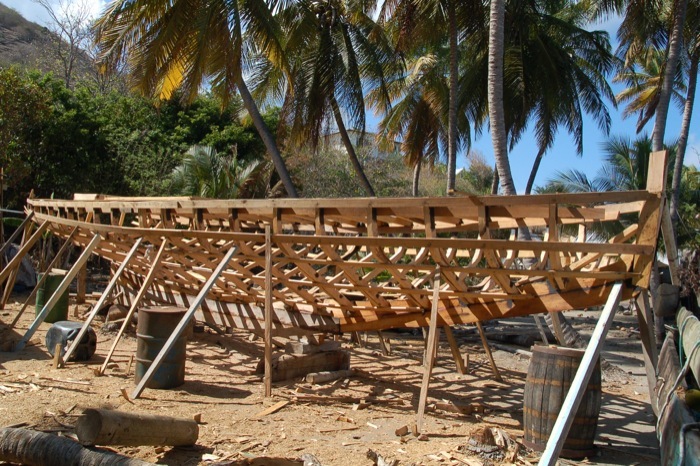 The West Indians do much the same thing to their houses, building a new, bigger one outside the old, and so I suppose it would not occur to them to consider this style of boat building unusual. Sitting outside his house just above the beach we met Frankie, the proud owner and builder of the “large decked sloop”, Deep Vision. Deep Vision is not so pretty as the smaller sloops – or at least, not to my eyes – but she wins all of the races in her class. 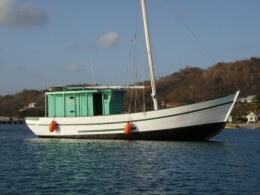 Not satisfied with this fact, the young man plans to take her up-island to Antigua and, having wiped-up again, to sell her; then he will be able to build another, even faster boat. At the far end of the line of boats we finally came across Bernard Compton. 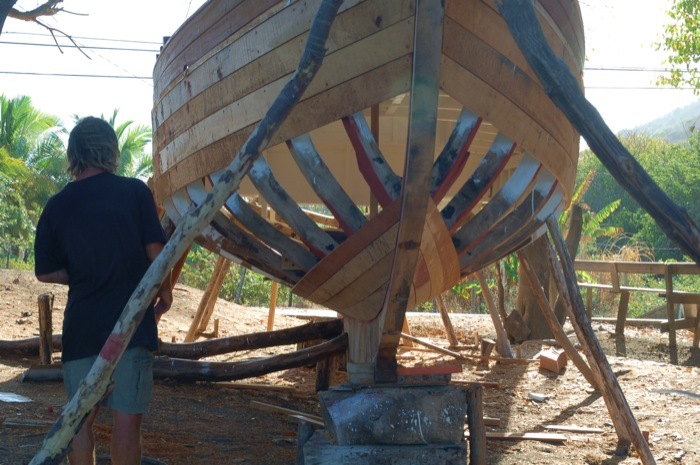 With a name like Compton this fellow can certainly claim to have Scottish blood running in his veins, and his skills also seem to confirm the idea of kinship with those first Carriacou boat builders: Bernard is renown as the number one Master Shipbuilder in Carriacou. He didn’t build Summerwind – the chap who built that fine vessel is no longer with us, we were told – but he built the aforementioned Glacier, and he has built numerous other boats all of which give the opposition a run for their money. Q: How will you caulk the seams? A: With caulking cotton sealed over with pitch and then with epoxy resin. Q: What does it cost to build a boat like this? A: For a 28-footer it costs around £40,000, including all of the materials and the labour but not including the rig. Q: What ballast will she carry? Summerwind‘s only ballast consisted of big stones, and Nick has happy memories of being put to work in the hold, shifting them up to the weather side after every tack. Noting that the new boats make use of modern materials he wondered whether the builders have also moved on to modern methods of keeping the sloops upright – and this proved to be the case. 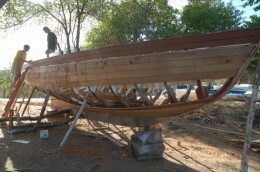 Bernard’s latest boat will be fitted with an external keel made of lead and weighing one ton. There will also be a certain amount of loose ballast, but again, this will consist of lead pigs rather than rocks, pigs being less inclined to roll around. The boat will also carry sandbags, which can be emptied after the weather mark has been fetched and they have become redundant. “How long will this boat last,” we asked Bernard. 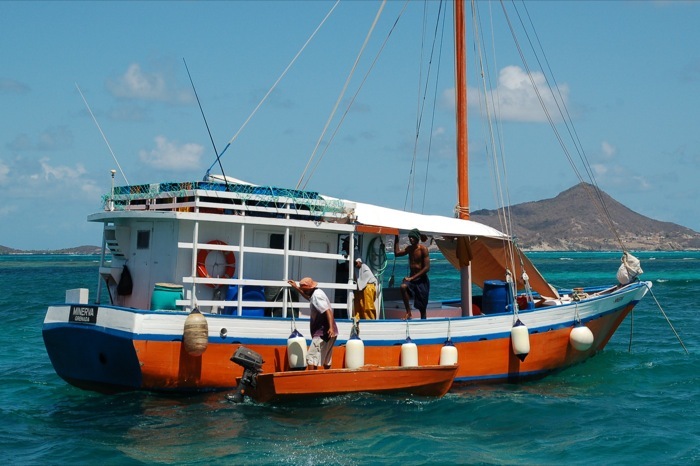 According to local legend, some of the Windward boats don’t actually have to last for very long; some pay for themselves in one night – or so the story goes. Seemingly, more than one old tradition is being kept up. Just read your account of boat building in Windward, C’cou. I was almost born in C’cou (Mum went down to G’da for the birth and brought be back on a schooner at a month old), and have seen many a boat built at Windward. Every time we visit there’s a new one being built and we were fortunate enough to be there for a launching in Jan 10. Fascinating day, and never ceases to amaze me how the skills of their Scottish ancestors were passed on to their sons….and to their sons. I wonder, will our sons carry on anything we have taught them??? A Kayak. Hi Diana. I’m reading your father’s autobiography. I’m currently doing some research into my family tree, the Shade family. My grandfather is called George “faithman” Shade. I understand that he worked at your father’s Craigston Estate as a foreman. Did your father ever mention him to you, or the Shade family in Mt Pleasant? 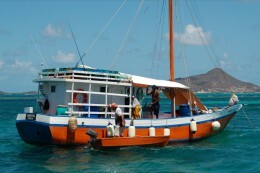 I’m fell in love for cargo boat fron Carriacou. I would like buy one from 35 to 40 feet, with engine and veil. Now, i’M living in Dominica. don’t suppose you want a co- owner Nelly? 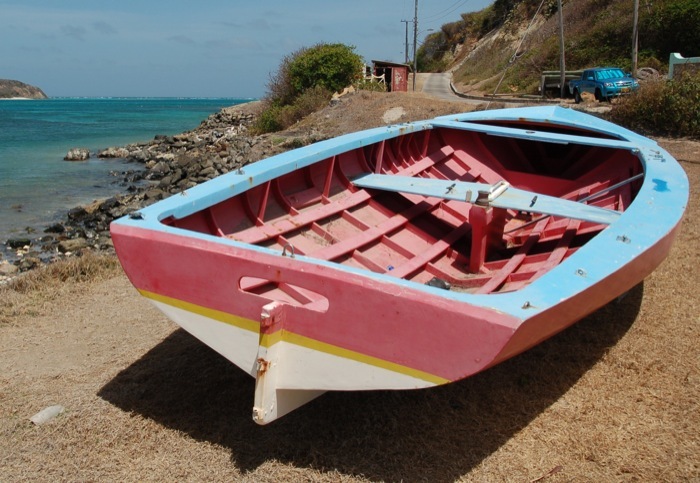 I’ve been looking for a carriacou boat too. 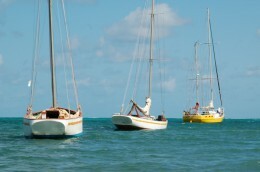 I’m from Frederiksted and have loved Curriacou Sloops since I was a kid .. always wanted to build one. Thanks for this article. Above web link to the 3D models I built last year… enjoy.